WASHINGTON, Dec 16 2011 (IPS) - Defence Secretary Leon Panetta’s suggestion that the end of the U.S. troop presence in Iraq is part of a U.S. military success story ignores the fact that the George W. Bush administration and the U.S. military had planned to maintain a semi-permanent military presence in Iraq. 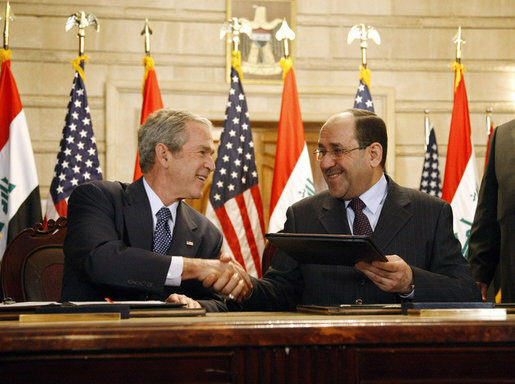 Maliki needed Sadr’s support, which was initially based on Maliki’s commitment to obtain a time schedule for U.S. troops’ withdrawal from Iraq. Maliki’s national security adviser Mowaffak Al-Rubaei revealed in a Washington Post op-ed that Maliki wanted foreign troops reduced by more than 30,000 to under 100,000 by the end of 2006 and withdrawal of “most of the remaining troops” by end of the 2007. In June 2007, senior Bush administration officials began leaking to reporters plans for maintaining what The New York Times described as “a near-permanent presence” in Iraq, which would involve control of four major bases. As recounted in Linda Robinson’s “Tell Me How This Ends”, Zebari urged Cheney to begin negotiating the U.S. military presence in order to reduce the odds of an abrupt withdrawal that would play into the hands of the Iranians. In a meeting with then Secretary of State Condoleezza Rice in September 2007, National Security Adviser Rubaie said Maliki wanted a “Status of Forces Agreement” (SOFA) that would allow U.S. forces to remain but would “eliminate the irritants that are apparent violations of Iraqi sovereignty”, according Bob Woodward’s “The War Within”. Maliki’s national security adviser was also seeking to protect the Mahdi Army from U.S. military plans to target it for major attacks. Meeting Bush’s coordinator for the Iraq War, Douglas Lute, Rubaie said it was better for Iraqi security forces to take on Sadr’s militias than for U.S. Special Forces to do so. He explained to the Baker-Hamilton Commission that Sadr’s use of military force was not a problem for Maliki, because Sadr was still part of the government. Predictably, the operation ran into trouble, and within days, Iraqi officials had asked General Suleimani, the commander of the Quds Force of Iran’s Islamic Revolutionary Guard, to intervene and negotiate a ceasefire with Sadr, who agreed, although his troops were far from defeated. In the days that followed that agreement, Iranian state news media portrayed the Iraqi crackdown in Basra as being against illegal and “criminal” forces.